How Secure is Your Factory Floor? This graphic is a visual representation of the MEP National NetworkTM. The Network has MEP Centers in all 50 states and Puerto Rico. Each Center is a partnership between the federal government and a variety of public or private entities, including state, university, and nonprofit organizations. This diverse National Network with over 400 service locations, has manufacturing experts serving as trusted business advisors and technical experts ready and able to assist small and medium-sized manufacturing companies. Focused on helping small and medium-sized manufacturers generate business results and thrive in today’s technology-driven economy, the MEP National Network comprises the National Institute of Standards and Technology’s Manufacturing Extension Partnership (NIST MEP), 51 MEP Centers located in all 50 states and Puerto Rico, and its over 1,300 manufacturing experts at over 400 service locations, providing any U.S. manufacturer with access to resources they need to succeed. In FY 2018, the MEP National Network interacted with 27,707 manufacturers, leading to $16.0 billion in sales, $1.7 billion in cost savings, $4.0 billion in new client investments, and helping to create or retain more than 122,000 U.S. manufacturing jobs. View the National Impact Data PDF for more information about NIST MEP, the National Network, and client impacts. Centers tailor services to meet critical needs, ranging from process improvement and workforce development to specialized business practices, including supply chain integration, innovation, and technology transfer. MEP's foundation is built upon its partnerships. 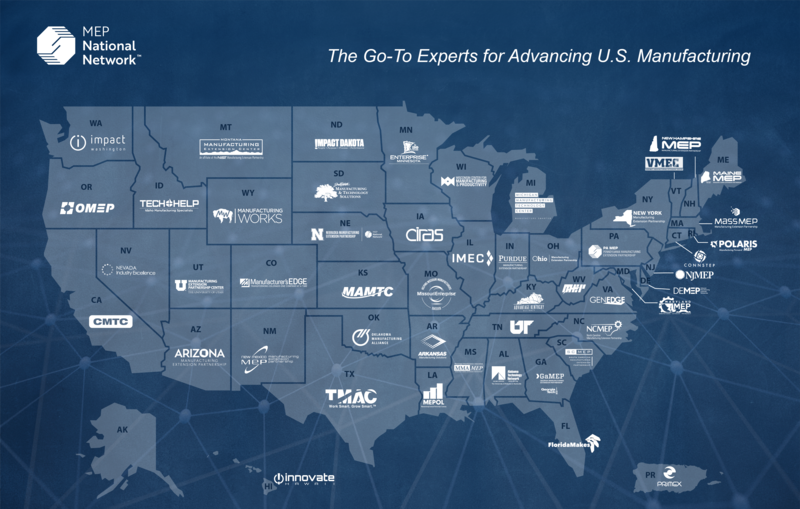 Centers are the hub for manufacturers, connecting them with government agencies, trade associations, universities and research laboratories, state and federal initiatives, and a host of other resources to help them grow and innovate. Learn more about the strategic goals and measures of success by viewing the PDF of the MEP National Network™ Strategic Plan . MEP Centers have helped thousands of manufacturers improve operations, increase profits, create or maintain jobs, and establish a foundation for long-term business growth and productivity. Centers showcase the products these manufacturers create with Made in Your State programs, a component of the Make it in America campaign. Contact your local MEP Center to learn how the network helps manufacturers thrive. Faustson Tool, a client of Manufacturer’s Edge (the MEP Center in Colorado and part of the MEP National Network), operates a 16,000-square-foot facility with more than 20 highly skilled employees and is owned and operated by Alicia Svaldi. Faustson Tool remains in the forefront of the manufacturing industry, continuing a tradition of pioneering the newest technology and pushing its limits. Faustson Tool takes on the most challenging applications only a few U.S. companies can handle, using state-of-the-art precision machining to do things no one else in the industry thinks can be done. Faustson’s reputation for innovation and excellence has earned the company prestigious clientele: Faustson Tool manufactured a key component in NASA’s Kepler space telescope, and has worked with Ball Aerospace to produce parts for the U.S. F-35 Lightning II Joint Strike Fighter jet. Manufacturer’s Edge has helped Faustson Tool improve product flow and production, be innovative and stay competitive in today’s manufacturing world. One of the most impressive results of this collaboration has been the development of the ADAPT Advanced Characterization Center, a 3D metal printing research facility.